Click "Generate Report," and you'll see your results below the rules. It's a good idea to export the report, so you can check the integration. After you've set the rules in Zoho Books, login to Tax1099.com. Go to the Imports tab, and click Zoho Books. Select the appropriate tax year and enter your Zoho login credentials. If you get a message stating “Data or amount not present for year 2015,” go back to Zoho Books. Make sure that you have rules setup for that year. 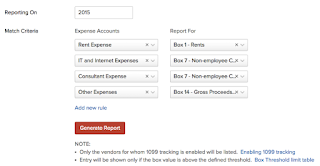 In Tax1099.com, look for vendors who may have red dots next to their names. Click on "flag" at the top of the table to filter the grid for vendors with red dots. These vendors may have data formatting issues. You can fix these in Tax1099.com or return to Zoho Books to fix the errors. If you edit in Zoho Books, you'll need to re-import. Download the error list before fixing any errors so that you can have it as a reference. Many edits can be made from within Tax1099.com. You can also bulk edit, by choosing the “Apply to Selected” option. 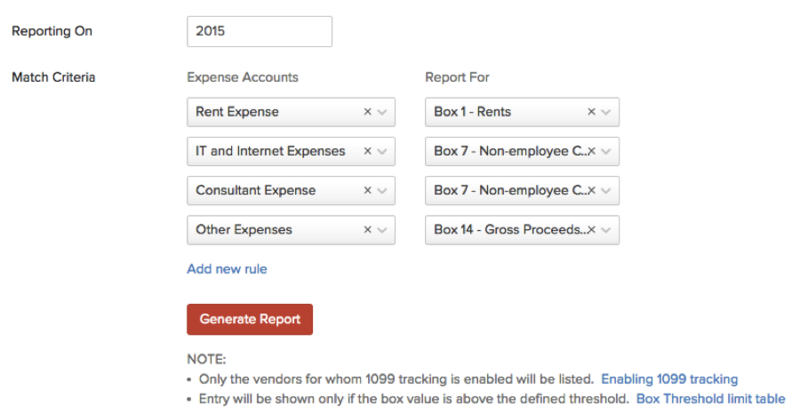 This feature allows you to change box categories for multiple vendors at one time. As you make changes, the system auto-saves. If you exit during the process, you can return to the last auto-save. You should process one company to completion. The system only stores data for one company at a time. We schedule all forms to E-file with the IRS on the deadline date, March 31. This gives you a window of time to make edits. After you submit the form, you can make changes until the scheduled date. If the scheduled date of the form has past, edits must be made using a corrected form. Vendor form delivery is also available through Tax1099.com. We offer e-delivery through e-mail and/or through a secured portal. With our portal service, we track vendor opt-in statuses. This is required under IRS Publication 1179. You can also request USPS mail service from Tax1099.com. If you'd like to print and mail the forms yourself, you may do so. Forms can be downloaded from your account, and printed on blank paper. Integrate your Zoho vendor data with Tax1099.com. Take advantage of a best-in-class e-filing solution.